Iâ€™m sure all of you know that the Pig Hoof is my favourite Big Muff pedal. In fact, I like the pedal so much that I asked Electronic Orange for a unit tweaked and customized especially for my setup. 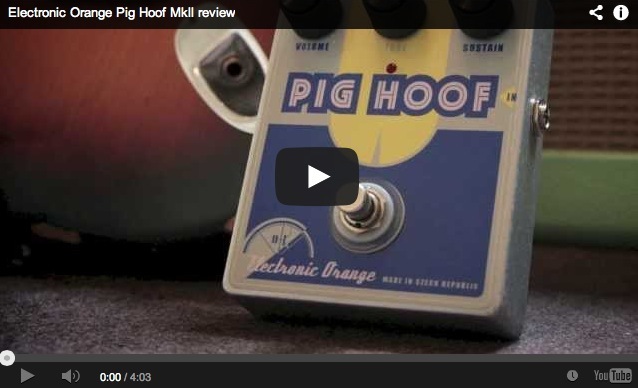 Iâ€™m without doubt too impartial for a review, so consider this more of a presentation of the new â€œyellow labelâ€ Pig Hoof MkII. 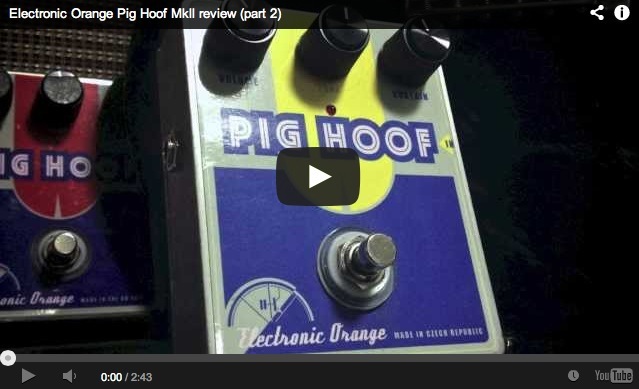 The original â€œred labelâ€ Pig Hoof is based on a mid 70s EHX violet ramâ€™s head Big Muff (see my review of the standard Pig Hoof here). These pedals had a bit more gain, lower end and volume, than their predecessors. Quite nasty beasts. I’ve recorded this clip using a Reeves Custom 50 with 4×12″ cabinet loaded with Weber Thames speakers and a Fender Strat with D Allen Voodoo 69 neck and middle and S Duncan SSL5 bridge pickups. The first clip has a mellow and warm tone with the guitar volume rolled down to 8. The last clip is an attempt at recreating David Gilmour’s live tones from The Wall especially, with an aggressive tone with lots of modulation and sustain. See the clip for specific settings. After using the Pig Hoof â€œred labelâ€ for some time and experiencing how it worked in a band setup, stage and studio, I noticed a few things I wanted to change. The 70s Big Muffs has very little mid range, which sounds awesome when you play alone but the tone has a nasty habit of drowning in a dense band mix. Our music is drenched with keyboards, organs and backtracks and I often got feedback from the most eager fans that they had a hard time hearing my guitar. I asked Jan, the man behind Electronic Orange, to make a version of the â€œred labelâ€ that was more suitable for both recording and for blending with boosters, which meant that it had to be tamed considerably. Enter, the Pig Hoof MkII â€œyellow labelâ€. What we did was essentially cutting the low end to eliminate most of the low frequency rumble. On a recording, you usually cut everything below 100Hz anyway (or perhaps up to 200Hz) and too much going on in the lower frequencies will only cause a muddy tone. The pedal still has plenty of fatness. Weâ€™ve also rolled off the gain considerably. This was important for me because I always use a booster with the Muff for my live sounds and the booster is always set for a mild breakup. I prefer this rather than having the Muff handling the gain alone. It makes the overall tone sound bigger and more balanced and it also drives the amp and its tubes a bit harder, adding a bit more compression and mid range. In this clip I’ve attempted to demonstrate how mild and tamed the Pig Hoof MkII is. The first clip, Dogs, might sound just a bit too thin and clean but that’ll give you an idea how the pedal sounds alone with a close to overdrive setting. The last clip, Raise My Rent, shows how this mild setting sound when the Hoof is paired with a booster and the Electric Mistress. The MkII also feature a trim pot (located on the circuit board), which allows you to adjust the resistance or amount of gain. This means that you can increase the gain for low output pickups and bedroom setups or roll down the gain for high output pickups and more aggressive boosters and amps. The difference between having a trim pot for the gain and just adjusting the main gain control, is obviously that you can fine tune the gain structure but it also gives the gain control a much wider sweep. Rolling the trim all the way down, boosting the volume and leaving the gain at 3 oâ€™clock produces a warm and dynamic overdrive that Iâ€˜ve never experienced from any other Muff. Set the trim all the way up and youâ€™ve got a Muff that creeps into the wild fuzz territory with a super saturated distortion with lots of harmonics. Compared to the Cornish P1, the MkII has less gain and lower end. However, I think the MkII sound more balanced and perhaps even a bit more open and transparent. Still, theyâ€™re in that same ballpark tonewise. Compared to the Civil War and green Sovtek Big Muffs, the MkII is a whole different pedal and perhaps hard to compare. The Sovteks has a much more saturated tone with considerably more mid range, lower end and gain. However, the MkII blends better with boosters and has more of that vintage 70s vibe to it. If you do decide to order a Pig Hoof MkII, then keep in mind that this pedal is specifically tweaked for my setup, preference and playing style. Iâ€™m sure some will experience that the pedal doesnâ€™t work as good or perhaps not at all, compared to other models. Still, thatâ€™s pretty much the case with any pedal. Personally I love it and think Electronic Orange managed to create a Big Muff model that doesnâ€™t sound like any other on the market. Check out ElectronicOrange.cz for more details and ordering info. Bjorn, have you had the opportunity to compare the Pig Hoof to the Vick Violet Ramâ€™s Head? Yes. The Pig Hoof is more vintage sounding. Very scooped, with a sparkling top and lots of low end. It’s by far my favourite Muff, always been, but it can be difficult to get it to cut through on scooped amps like Fender and similar. The MkII was a version I asked for to have one that was easier to record. Less lows and gain. On some setups it can sound a bit thin but again, it was designed for my recording setup. The Vick is perhaps a bit more modern soundibg, with more gain and and overall more compressed and satured character. The 3-way mids switch makes it very versatile. Hi Xander, I usually don’t recommend VOX amp for the typical Gilmour tones. They lack a bit of that mid range essential for many of his tones. Still, with a couple of mid range oriented pedals, you should be able to cover a lot of ground. I would go for something like the Boss BD2, Fulltone OCD or similar for overdrive (rhythm and medio gain solos) and a RAT or similar for distortion. I would not go for a fuzz or Muff as they tend to sound thin on Vox amps. Read this article for more tips on how to choose the right pedals for an amp. See the buyer’s gear guide for modulation for some tips. I’m putting a pedal board together and would like some advice on which Pig Hoof or other muff pedal to go with my setup. It’s for home use only and will be played at bedroom volume. I’m leaning towards the pig hoof mk2 after reading and listening to your reviews, but would like to know your opinion on which pedal would suit my setup best. Sorry forgot to add I run my Hoof threw a Buffalo power Booster , delay then RT20 , the booster really does make it shine. Hi Born , received my Pig Hoof last week I was amazed how loud it was but also how low it can be played perfect for bedroom use. The setup I love is with a bit of delay and the Boss RT20 sounds awesome . I understand the less bottom on Mk2 but regarding the less overdrive, on the red one it could be achieved by turning the gain lower, correct? Or there is more to it? Well, yeah but what we wanted to do, was to give the gain control a wider sweep, so that you could turn it down to almost a mild overdrive and when cranked, it’s still easy to tame, without too much noise. The idea with this pedal is not to provide the full ram’s head experience but rather to have a Muff that’s easy to blend with other gain pedals. I will be going to Europe in August but when I get back I am going to order the yellow one. The youtube samples for yellow I liked very much, more than red one. I think you and Jan did good job on the yellow one. I don’t gig anymore, so just for home studio work yellow probably is a better choice. Hi Bjorn, hope your well , I finally took the plunge today ,Jan put my name on the list for a Pig Hoof Mk2 can`t wait . Hey bjorn. First time comment, but long time fan of your site. You have helped give me the knowledge thru the years of achieving tones where I can actually give my own self goosebumps, and play for hours just playing solos, riffs and chords, just enjoying my own tones. Thanks for that. The mkii pig hoof is absolutely the finest muff I’ve ever heard. I own the mojo hand collosus, BYOC large beaver, NYC reissue, buffalo fx patriot, and now mkii pigfoot which is hands down the most articulate, open, and transparent muff I ever heard. Thing string separation with chords and sustain is beautiful. Also higher notes don’t sound to thick when using my tube driver. Those high notes really sing. If I were to pick a second, it would definitely be the buffalo fx patriot. One thing I want to add. I know you put a muff before a tube driver (booster) in the chain. I can’t get a decent tone unless I put the muff after my tube driver. I have tried all my muffs first in the chain on my boogie, traynor and fender tube amps with no success. On all of them the tone comes out choked, muddy, and less harmonicly rich. Am I missing something? Hi Sammy! Thanks a lot for your kind words! Glad you like the MkII! There are no rules when it comes to tone and how to stack pedals. Keep in mind that what you’re essentially doing, is to combine your guitar, and its pickups, with two gain pedals and your amp. How this work and how you should set it up, depends on the voicing of your pickups and the amp, the amp settings and of course the pedals. What works for me, might not work for you. Seems to me that you mainly use amps with less mid range, which often require having the overdrive first, creating a darker and more compressed tone. Sounds to me that you’re enjoying your tone so why worry and change it? Hi Bjorn! 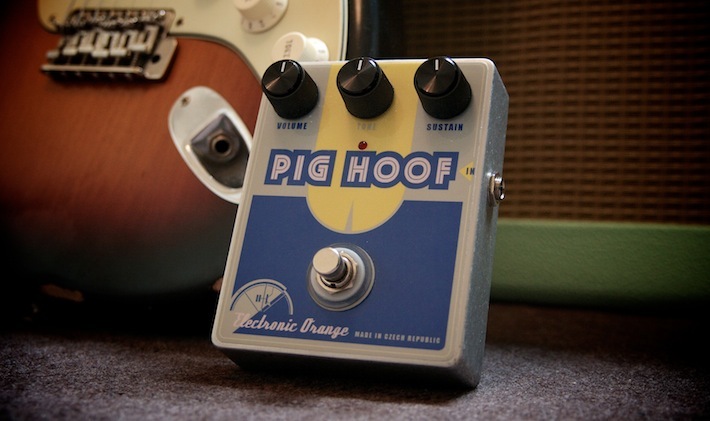 Do you think the Electronic Orange Pig Hoof MKII (I’ll probably buy it and not the original red-labelled because I’d use it with boosters) could go well with the Buffalo Powerbooster or it would be even better with an overdrive like the Butler Tube Driver or the Effectrode Tube Drive (which is quite similar to the Butler, except for the boosted mid range in the Effectrode)? Other thing… Do you think the Buffalo Powerbooster could work well also as a clean booster to raise the volume and to add a bit of presence to my Costalab Custom Muff and my other gain pedals when I need to? The Powerbooster goes nicely with the Pig Hoof MkII. In fact, that’s the combo I prefer myself. The Powerbooster is an effective way of adding a bit of tone and presence to most Big Muffs. The Tube Driver often work better on Muffs with less gain and if you want a slightly darker tone. Thanks a lot! I won’t buy a BK Tube Driver because, after having tried a friend of mine’s one, it has quite disappointed me! Moreover, I’m more interested in David’s 70s tones until Animals (that is my Floyd’s favourite work with The Drak Side Of The Moon) and infact I’d like to buy the Buffallo Power Booster or the Throbak Overdrive Boost! What are the differences between them, in terms of tone? The Throbak seems warmer from the videos I’ve watched while the Buffalo seems a lot colder sounding. They’re very similar. The ThroBak has a slightly more twangy clean tone and brighter overdrive. The Buffalo is overall warmer and the breakup is smoother. Both works great for boost and overdrive, so it’s more down to whether you got a bright or dark amp. Thanks a lot! I have a Peavey Classic 30 and I’m gonna buy a Fender Bassman 59 LTD so probably the Buffalo would be a better choice! Hello Bjorn – I have just ordered this pedal based on your review and recommendation. I am currently using a TC Electronics Nova system, and I would like you recommendation on how to incorporate the pedal in my system. I am using a fender Superchamp X2 15 watt tube head and the fender 1×12 cabinet. Thanks much! I haven’t tried the MkII on a Fender amp, so I can’t really tell how it will sound. You may find that you need to lower the high end and increase the mids on your amp. Again, I’m not sure. Depending on how you use the Nova System, I’d either connect the Muff after the board or, if you use the modulations and delays, somewhere in the middle, using the send/return loop. Ok, thanks – my amp doesn’t have a send/return loop – so I’ll just try experimenting before and after the Nova System – it has the Nova analog drive circuit and a boost pedal so it maybe best putting the Hoof before – I am excited to try it. Thanks for a very interesting website! 1) should I put my Pig Hoof MKII before or after my Boss BD 2 ? 2) it is correct if my MoonVibe I put into loop with delay, chorus and other modulation effects ? I’d place the BD2 AFTER the Pig Hoof. In regards to question 2, you mean that amp’s effects loop? Yes, you can place the MoonVibe there. You can also place it in front of the Pig Hoof and BD2. I prefer having UniVibes and phasers before the dirt pedals. They sound better that way. similar to the original I’ve heard; currently I play the original 1973 ram’s head, chosen over the years, thanks Jan Horinek! Hi guys, here is Jan from Electronic Orange. We have moved a step ahead and changed the look of our Pig Hoof MkII (as well as the old red label Pig Hoof). Instead of the common aluminum enclosure, we will now provide you with a custom made, sturdy metal enclosure, which is silk-printed by hand. For the same price, you get a smarter look, a steel, old-fashioned battery door on the bottom side, and removable rubber feet – so if you want to stick Velcro on the bottom, you simply unscrew the feet. The most important thing however is that the new enclosure will help to produce more pedals, so the waiting list won’t be so helplessly long. which pig hoof muff would suit this amp, red lable mk1 or yellow mk11 ??????? I play through a Reeves Custom 50, just received the Pig Hoof MkII and am having trouble getting a smooth full tone. I have a Throback after the Pig Hoof and I am wondering what settings you use for the Throback to get the tones you have in your clips, or closer anyways, fingers count too, Ha! I am playing a DG Strat and have to roll the volume back to 4 or 5 to smooth everything out but still not getting exactly what I want. ringranzio you all the information you give us .. I have a blackstrat, the handle has fat50, the center has fender69 and the bridge has ssl5 .. I would take an electric orange and I’m not sure which one to buy .. I love the tone of the MKII, and I currently have a BD2(keely)on my board. before I place an order for the MKII, I was wondering if you think the Effectrode Fire bottle would pair better with the MKII? I only play at home and thought I might dedicate the BD2 just for overdrive use. My rig is as follows: Strat with voodoo blues, into a Laney cub head paired with 2 12″ weber thames. I generally just play to backing tracks in the 1 watt position and amp volume around 8.
hi bjorn .. again thanks for this amazing website .. upon further research ” fender forum ” and many others.. i decided on a pickup combo you pretty much said was the best .. cs 69 neck and a duncan ssl 5 bridge… and yes i soon learned they dont fit telecaster , only strat …. broke my heart to hear that …. then i read your tele suggestions and im gonna get the nocaster for the neck pickup for sure … but i think you said for the bridge pickup youre using a late 60’s type ? what type ? are they available ? also i called seymour duncan and they said a STL 2 for telecaster is very close to a duncan SSL 5 .. do you agree ? ………. one last thing , any thoughts on a duncan broadcaster pickup for telecaster bridge … as compared to the STL 2 ? …. by the way im scrapping the roland cube idea for a 15 watt laney cub instead ….. cuz i dont just want ” the tone ” …. i need it bad …. thank you tone doctor … have a great holiday season bjorn ! Hi Bjorn! Congratulation, or which is more important; thank you! I have got from Jan the ordered MkII and the Bananaboost! Great pedals indeed, and now I know already; they are the final solution in my actual setup! I do not use the Tube Driver at home anymore, I do not fight with tones and EQ, after the Sovtek clones of Mojohand! It simply works awesome! Clean, transparent and a real gilmourish sound definitely! I really enjoy to hint the newcomers from Electronic Orange, on the pedalboard! Thanks for playing us, thanks for sharing these highly appreciated informations! Did you try the MKII on the new Airbag recording sessions? I am eagerly waiting for the CD! I have the Pig Hoof and PH MkII and absolutely love them! My rare Skreddy Wallbuster is likely going to go on eBay because these two pedals win hands down – I cant wait to get one of Jans Banana Boosts to stack them with. Seriously people – get a Pig Hoof! This is completely unrelated but I figured I’d post this as it is quite the coincidence. I’m not sure if you remember from a while back on this site a guy named Adrian Emond who would always post on the website. Anyways, I recently applied to and got hired at a local guitar shop, I met my coworkers and everything is fine and dandy until I talk to one of them about this website. Turns out that by some strange coincidence, I had unknowingly applied and got a job at the exact same store as Adrian, and work with him through the majority of the week. I just found that to be hilarious and I figured I’d share this with you. I join everybody to congratulate you for this exhaustive review. It’s a little off topic but I cannot find where to post such a question. After reading many threads here, after reading the David’s gear section, I still have (and I guess many ones too) some difficulties to set my pedals to sound great. I mean not so difficult to set the fuzz or muff alone, but when combined to other effects, especially boost and overdrive, the setting combinition become more complex and I sometime get lost. Gilmourish is a concentrate of precious information and very well documented but I guess a raw tone bank (mp3 flies) would complete the picture. I mean how does sound the mild OD tone of a Colorsound compare to clean signal? With a sound file one could set any OD pedal to come as close as possible to the reference tone. This would be a wounderfull tool for tone building. Should you consider this suggestion. Hey Bjorn, I was wondering about the trim pot on the MKII. Could it get as much gain as the red label Pig Hoof with the trim pot set to maximum? so with that said, my set up is, black strat, rams head muff, rc clean boost, hartman flanger,, boss rt-20 and mxr carbon copy, going to a fender blues jr, would the yellow lable work for me? Bjorn forgive me, but I found the sound too educated and with little character. The sound seems to me all too clear and controlled, which Gilmour, in my opinion, has never had. I still prefer by far the Caroline Olympia fuzz which I think is just a pedal that comes close to the magic sound of David. Dude, I just gotta say, your awsome at guitar, I hope one day I can be half as good as you. The fact that you inspire me with your playing, means alot. Thanks for the site, and all your help with my gear purchases..
Hey Bjorn! I messaged you not too long ago about sending you some music clips on Facebook, just lettin you know which Brad your talking too.lol quick question, is your new yellow label, similar to the iron bell? You said it has less bass than a normal rams head. So does the iron bell. But the iron bell isn’t only similar to a rams head…could you tell how they compare? Thanks! Lost for words))))! Great TONE and masterly performance! Hi Bjorn, I’d really like if you did a review for the Way Huge Swollen Pickle Mk II and how to get some Gilmour tones on it (Animals-Final Cut, if possible). Thanks! my setup now is: demeter compulator – demeter fuzzulator – pig hoof (red) – butler tube driver (overdrive) – phase 90 – boss tr 2 – moon vibe (chorus mode) – trex reptile – catalinbread echorec – fender blues deluxe. now my question: any suggestions to the order of the pedals, replacing a pedal, adding or discarding one? I like your sound for the Animals period. I think the special feature for a muff will be a tone that can add clarity to the sound without the drastic cut of mid range freq. that occours on Ram’s Head big muffs, but retaining the overall “tone” of this circuit. Pete Cornish accomplished to this, but not completely, with the P-2, because the tone of this pedal is a little too midrangey for the Gilmour Tone. I have had some new and vintage muffs, and also the Skreddy Pink Flesh (that I think have the same problem of P-2: too much mids). The best gilmourish sond for me is a typical Ram’s Head circuit boosted (pre) with a parametric EQ to reduce the boomyness of bass freq. and boost the mids just a little, not too much. Actually I use The Cornish P-1 with a Empress Parametric EQ. Now we’re talking about some serious Muff here. This sounds like a perfect match for my setup, but your opinion is more than welcome. Would it be great for this setup: Throbak ODB, Whirlwind OB phaser, EHX 90’s Deluxe Mistress, Boss RE-20, to a Peavey C30. Thank you!!! Iâ€™m really considering buying the Pig Hoof. Currently for home recording/practicing Iâ€™m playing 62 MIJ Telecaster with Nocaster pickups and a Laney Cub 12 combo. For Overdrive Iâ€™m using a TS9 and for distortion a RATII , both boosted by a BD2. Iâ€™m not quite satisfied with the RAT though and so I want the Pig Hoof. What do you think? And what version would be better? Another Quick Question, Why does David Actually use Wem Cabinets instead of Hiwatt cabinets? When I finally get the old ’72/’73 Hiwatt head Im going to have to build a Cabinet for it. I’m not sure yet whether to make it a 2×12 or a 4×12… I’m sure a 2×12 will be easier to handle and loud enough, but I also think if I’m getting a genuine 70’s Hiwatt I should get it over with and make it a 4×12. Anyway, I’ll definitely check out the Weber Thames speakers. Bjorn, I think this might be the best sounding demo I’ve ever heard here or anywhere. Wow, I can’t play quite as good as you just yet but you sure do make this gear sound nice and give me a goal to set for myself. I’m playing through a reissue Fender Twin Reverb and I can hear the difference in the Reeves. That is the next amp on my list then I can blend the two. The Analogman bc109 and throbak overdrive boost you recommended has been getting me some real nice compliments on my tone on time. I’m using a Stomp Under Foot violet ram’s head but this pedal makes me think I need to try it out. I think the rhythm tone in Dogs played behind the line “And it’s too late to lose the weight you used to need to throw around” is simply one of the coolest guitar sounds ever recorded. For some reason I call it the “clam” tone. If I had to guess, it sounds like a CPB through the yamaha rotatating speakers. However you don’t mention a CPB being used in Dogs in your settings section. What do you think David is using here? What do you like to use in that section of the song? Which unit would cover most closely Black Keys sound? In a recent review, you gave all your amp settings, from your beloved reeves to your Peavey classic 30, including the Laney Cub. Hey there Mr. Riis! I love my Musket, but im soon to be switching amps from my vox to a dr103 clone im almost done building, and I was looking at getting a colorsound clone like the banannaboost for the pre muff Gilmour stuff. But I think boosting the Musket is perhaps slightly redundant because of the pre knob, and it sounds amazing alone. So I was considering getting something like this new toy you have or a large beaver to use with the colorsound clone and set it for a more mild setting, and set the Musket for the balls out wall of gainy goodness. Do you think this is a good idea, or should I just get the bananaboost or bd2 and forgo the second muff? Also what are your personal thoughts about the bananaboost? Is it a worthwhile investment for a colorsound clone, or would the keely bd2 do the job,(ive played the regular bd2 and liked it but I havent tested the banana), and I trust your opinion fully on these matters as you have got me to spend date night/bar $ on gear instead of my ex’s by posting great reviews and giving me great advice lol. Thanks a ton! really nice demo and paying! quick question: Which patch cables do you rather recommend to hook up pedals? lava, evidence or george l’s? Do they differ much? Sorry if it’s been asked somewhere before.. This is the first time that i don’t like a sound on this site :) Not in love for this, i love Airbag sound on your last album , I hope that will not change in the future! Okay, you’ve done it again! I’ve scoured the net, and watched every clip I could find,( as if yours wasn’t enough! ), and realized that the Throbak is everything the Colorsound is, and more, and I guess the Echorec, or the Univibe will have to wait. Those pedals are like icing, but being part of your essential tone, a boost is like the cake. The icing is sweet, but without the cake, there is no substance,( quite a good metaphor if I say so myself!). So, here’s to another $309.00 you’ve convinced me that I need to spend! Thanks alot! I think I have another new nickname for you, The Norwegian public utilities company, because you provide all the GAS! I know I’m a little hard headed, but I always come around, and I see your point very clearly. I wish I’d come to this conclusion six months ago, as I have a feeling it’s going to make a world of difference in the overall tone of the REEVES. Pig Hoof mkII and the original Rams Head Gilmour. settings in the Pig Hoof mkII or it has a different settings? I also would like to know if Pig Hoof MKII is the right pedal to replicate the Big Muff sound in the The Wall live 1980-81. What would be the right settings for the Pig Hoof MKII in that case? Congratulations on the 10 year milestone and please keep up the good work!! As always i loved the review, really a great sounding pedal. I know of someone selling a ’71 or ’72 Hiwatt DR103 head in fine working condition, for about 450 pounds, but without a speaker cab, or speakers. What kind of speakers do you think i could get, that are as close to the original Fane Crescendos that came out in Hiwatt Cabs? Hey again, sorry to continue about this, but you said the Spark is basically just a clean boost, but even if I leave the switch on clean,( I always do! ), I can turn the gain knob up, and get alot of drive without boosting the mids too much. Did you forget the gain circuit? I feel like Vinnie Barbarino,” Mr. Kotter, I’m so confused!”. he he. In the review comments for the Throbak, you recommend the Spark a few dozen times, and refer to it as “Great”, and “extremely versatile”. If I had my choice, I’d likely go with the Colorsound, just because so many of my favorite guitarists used it constantly, especially Jeff Beck, and David, but a new one here in the US costs close to $500.00 w/shipping, and while the Throbak is only $300, that’s still a lot of clammage, when I still don’t have a Univibe, or the pedal I covet most, the Echorec. So you don’t like the TC Spark? Up until recently you’ve been recommending it as “a great alternative”. I realize that you’ve probably had more time to acess it, but it seems like you’ve done a complete 180 on it. I have never played through a CPB, or Throbak, but understand the principle behind what they do, and the TC definitely smoothes out my fuzzes, and unless I choose to eq it differently, it doesn’t color my tone, but boosts my signal intact. I’m just trying to glean the difference I’d notice by spending another $300-$500.00 on the Throbak, or Colorsound? Bjorn, I’m sorry, but it seems to me that the sound on the song “Dogs” is too polite. Gilmour in this case should have used the Fuzz Face or the Powerboost with the gain to the maximum. Am I wrong? I want to ask directions. Settings for bedroom level you always recommends a RAT and BD2. The BD2 Keeley pleases me, the RAT not. You did great reviews of the TOPTONE DG2 and LIGHT DRIVE, seemed very good. These have high valuesâ€‹â€‹, but as I’m in Brazil importing a Keeley BD2 equates valuesâ€‹â€‹. The BYOC Large Beaver gave you score 10 bedroom level and this pleases me. I play with a modified Princeton 65 to 10 watts. I really enjoy your reviews and tips, but with so many options I’m lost. Taking into account these and their expertise, which recommends for a good tone Muff / Gilmour? Forgive my English and difficult to bother with it. As you’ve used the Laney Cub on the 1 W output, what were you settings on the amp? And again, did you have your Tc electronics Sparkle drive in the effects loop ? Not having access to a coulorsound pb, I’m curious, since you’ve played all three, what the major differences, and like characteristics of the CPB, the Throwback, and my TC Spark. Is the spark capable of the same basic tones produced by the colorsound when using it as a clean boost for muffs, and fuzzes, and because of the microswitch, and four knob configuration, is it a bit more versatile. And lastly, knowing my rig fairly well I would think, what settings would you recommend for boosting my AVS London fuzz, and should I set it for a clean biost, with the gain up just to the point of overdriving my amp, dial it back a hair, anx leave it on most of the time? I know that’s a lot of questions, and I have found a lot of great tones on my own, but I’m curious how Sweet Fingers uses his boost pedals. I’ve noticed you’ve gone to the throback instead of the colorsound, which I always thought was DG’s special sauce! Lovely demo Bjorn. I like the idea of internal trimmers for tweaking – Muffs being so “variable” and all. The RB is way too big IMO. I would (and sometimes do) rather have the choice of 2 Muff clones on my board. It’s surprising no one has thought of “customized Gilmour era” Muffs before … I mean other than private pedal builder / Floydians like myself. PS – I have custom shop 69 pickups. So what do you think should be the determining factors as to whether one gets the red or yellow? I have an Ampeg VT40 amp which is a 60watt 4×10 combo. It has a very flexible eq and I usually pair it with a vibratone type leslie (one 10 inch speaker firing into a rotating baffle). My tone is usually on the darker end. I have a colorsound powerboost. I think you’re playing is fantastic, but I do think your recording of Dogs with the MkII sounds a little thin somehow. Didn’t Gilmour do a lot of the solos with a muff alone, and not with the colorsound? I’m leaning toward the red pig hoof, thinking I can always brighten things up with the cpb or amp settings. Also, I should add, the VT40 is excellent at cutting through a mix. The best way “not to G.A.S.” in my opinion is listening to those older gilmourish Muff reviews again. @Oliver: I know exactly what you mean when youÂ´re talking about this special “boxy tone” which has nothing to do with the well-known “boxiness” of an old Marshall combo, for example. IÂ´ve been searching for this special “raise-my-rentish” tone for years – and became mad thereby. *Haha. * Others had girl-friends and family, a good job, good reputation – IÂ´ve had knobs to fiddle with. – First comes the tone! Listen to BjornÂ´s review of the EarthQuaker Hoof Fuzz. Sounds also pretty “boxy” for me on some positions. The “boxiness” has a lot to do with the modulation. Of course also with the tone control of the pedal. Finding a new pedal that “nails the tone of …” has a long-standing “Groundhog Day” quality to me. Read the old reviews of the Skreddy pedals, Pig Mine, just for example. Oh, itÂ´s so -a w e s o m e-. Somebody must have spread some magical powder over pedal XY and weaved one of GilmourÂ´s strains into pedal YZ. Bla. The same procedure since years, and the main reason why I necessarily had to buy two of those outstanding Top Tone pedals and of course the inevitable Skreddy pedals, “Pink Flesh” and “Pig Mine” and one more. It would have never come to an end. Everything sounds great when Gilmour or Riis plays over it! I can understand that no-one wants to hear it anymore: But it seems to be true, that those guys have the magic it in their fingers, and not so much in their pedals! However, IÂ´ve attended another “Aussie Pink Floyd” show a few days ago, and, well, it was nice. Well playing (not perfectly gilmourish playing like Bjorn, though). Nice show. But the guitars (yet another phrase) soundwise didnÂ´t came close to BjornÂ´s Gilmour tones! I felt a bit disappointed therefore. The band sounded more like an “and-now-we-also-want-to-play-some-Pink-Floyd-stuff” league coverband to me. Very “GT-10ish” to my ears. At least on some parts. IÂ´ve paid more than for an original Pink Floyd 1988 show for this, and a lot more than for Gilmour solo 1984! what’s your overall impression on the Electronic Orange Bananaboost? Would it go well with this pedal like the original Colorsound and the Throbak? Comparing this pedal to a Musket, what do you consider the more important differences between them? Anytime you play something pre-Wall in your clips, my ears perk up a bit, especially anything off Animals, and you nailed it again. Nice having a pedal to truly call your own, and it obviously suits your rig, and your playing. Because of the Musket, I had put the Muff on the want list, instead of the must have list, but this clip has put it back on the must have list! Honestly, i was impressed by this pedal from the Czech guys as never before from another Muff. The “Raise My Rent” tone is a killer. Apart from you brilliant playing this pedal nails a special kind of tone that I was missing from all the other clones. This tone is what makes David’s tone so special IMHO. I am trying to describe it as a “boxy” tone. As if the speaker and the mike are closed in an old dusty cardboard box that you have found in the attic of your grandma. I am not sure if only the Pig Hoof is responsible or if the recording has an impact. But I never heard that boxy tone from other Muff clones on Youtube or other sources. Looks like the endless search has come to end. Thank you Bjorn for let us know the things we never realized to need! By the way, I miss your pedalboard info, where has it gone into your web? And congratulations for these FIRST ten years! Well done!